“More children are getting hurt getting on and off the bus than riding the bus,” said Cindy Dort, occupant protection educator at Cornell Cooperative Extension and coordinator of this year’s local Operation Safe Stop Day. This isn't a stupid issue, someone could be hurt or killed. I don't want to watch my son getting on the school bus and getting mowed down by an ignorant and careless driver. Thank you to The Saratogian and SeeClickFix users for increasing awareness and helping to resolve this alarming issue. For most, the mere mention of peer pressure can conjure anything from negative feelings to middle school flashbacks. Tina Rosenberg, author of a new book called "Join the Club", is on a mission to give peer pressure a better reputation while promoting social change. Rosenberg recently spoke with American Public Media's Kai Ryssdal to discuss the inspiration behind her book, and how peer pressure can effectively be used as a tool in promoting social campaigns. Her interview, featured as part of the Marketplace podcast, shed light on the positive power of peer pressure. A mother of three, Rosenberg is keenly aware of the stigma surrounding peer pressure, but she has seen first-hand the good it can do. ...we all know how powerful peer pressure can be, and how afraid grown-ups are of peer pressure applied to our children. But we can use this very powerful tool for good ends as well as for bad ends. I came to the realization because I was working on a story about a group of students in Serbia, who organized a movement that eventually was key in the overthrow of Slobodan Miloševic, and the techniques they were using were identical to ones that I had seen in a South African government teen AIDS prevention program. I started to think about, what is it that these two effective programs, which are so different in so many ways, have in common? And the answer was: they try and get people to change their behavior, not by giving them new information about how you get AIDS or how bad Miloševic is, and not by appealing to fear, but by giving them a new peer group to identify with, by changing their behavior into a really cool and heroic thing to do. This idea got our whole team thinking about how peer pressure has changed each of us for the better. After hearing the podcast, SeeClickFix Chief Strategy Officer Kam Lasater was quick to point out how peer pressure applied by our own Ben Berkowitz encouraged him to start picking up after litterbugs. We make it easy for our users to peer pressure their friends. When you report a new issue to our site, we allow you to quickly share it on your Facebook and Twitter. So next time you report an issue in your community to SeeClickFix, tell everyone about your good deed and get them involved in the fix! Nineteen days ago, SeeClickFix user Sherrie described the condition of Little Rock Road in Charlotte, NC as 'terrible' and 'dilapidated' complete with cracks in the asphalt, holes, and bumps. It is so uneven going toward the airport terminal. It is like trying to dodge bullets, trying not to hit the bad areas but you have to hit them because they are everywhere in the road. Sherrie added that the poor road conditions have been around for quite some time and wreak havoc on vehicle alignment. This has been like this since I have been living in this area, 12 years, why doesn't it ever get any attention? I would think that the city would want this road to be nice for visitors, considering it is an exit and entrance road to the airport. Thanks to the WBTV team, this issue is now getting the attention it deserves. A few days ago, the media outlet examined the road, reached out to NC-DOT, and received some promising news. They got right back with us saying this section of Little Rock Road is being considered for re-surfacing this year. In fact, they'll be looking over contracts in the near future. State DOT also says if for some reason resurfacing doesn't happen this year, they'll do some temporary patching to take care of it in the interim. "Moore" People Talking About SeeClickFix! Chris Moore, CIO of the City of Edmonton in Alberta, Canada, recently gave the SeeClickFix blog some much appreciated love by featuring not one but two of our recent posts on his paper.li The Chris Moore Daily. Tech-savvy Moore has been named one of Alberta's 50 most influential people by Venture Magazine. As CIO he lends his vision and leadership to the direction of Edmonton's technology. His goal is to transform Edmonton to an open community that allows all citizens to interact with their government, and with each other, by embracing innovation in technology. A great example of Moore's vision in action is The Edmonton Journal's SeeClickFix powered pothole map that allows readers to report and map potholes directly from the newspaper website. We're looking forward to seeing "Moore" civic leaders like this! We know, we know. Potholes seem like the only thing we talk about here at SeeClickFix. However, we've never actually discussed the origins of these nuisances. Well, you're in luck! Yesterday, I came across this article from Popular Mechanics that breaks down how these road craters form. The process starts with one small crack, which then fills with water. After the water freezes, the crack expands and the water pushes the asphalt outward and upward. It starts slowly at a weak spot, and once it starts falling apart, that creates larger cracks; then more water gets into it, and the cracks grow larger. Bruce Hucker, an engineer with the Illinois DOT, explained that potholes could also emerge after the ground beneath the road gets wet and sinks down. When you step on a dry yard, you don't leave any indentation because it's hard and it fully supports your weight. But when it gets wet, your shoe sinks down in it. The pavement will eventually crack after traffic drives over these spots and weakens the pavement. To read more about how these annoying potholes form, check out Popular Mechanics. With 166 days until the primary election, New Haven resident Doug Hausladen recently launched his campaign website for municipal office. And guess what's included as part of his platform? As a proud Ward 7 resident, Doug hopes to improve his community by encouraging his neighbors to report issues via SeeClickFix and even dedicates an entire section of his website to it. Before setting his eyes on public office, Doug ran his own small business and served as chairman of a local community management team where he collaborated with local residents and small business owners alike. Through this work, he discovered a community 'overflowing with potential, however much of this potential has remained untapped due to numerous obstructions.' Doug wants to help his community prosper by removing these obstructions. The SeeClickFix team looks forward to following Doug (and his use of our site) on the campaign trail! To learn more about Doug and his campaign, check out the campaign website, Facebook page, and Twitter account. Lately I feel as though potholes have been occupying a significant amount of my time. I'm writing about them on the SeeClickFix blog, reading issues about them from our users around the world, and protecting my Subaru from them on the streets of New Haven. It is that last piece of my recent pothole obsession - my seemingly futile efforts at protecting my used and abused station wagon - that made me carefully read an article we found recently. Testing and development processes for chassis and suspension systems carried out by Ford engineers at Dunton Technical Centre - one of Europe's largest automotive R&D centres - and Lommel Proving Ground, Belgium mean that Ford vehicles are designed to cope with the most demanding road surfaces. Tests include running real-world road simulations, high-tech data acquisition and thousands of miles of surface testing. I don't speak car fluently, but it all sounded impressive to me! Luckily, Autoblog.com put it in layman's terms for me. The Lommel Proving Ground in Belgium goes as far as to include an inch-by-inch recreation of a notoriously porous English road. More abusive road surfaces are simulated at Ford's Dunton Proving Ground in Essex, England. Ford says that between the two test facilities, it tests every wheel and tire combination sold on its entire European vehicle portfolio. ...mobile phones can empower citizens to voice their needs and concerns to the government. For instance, SeeClickFix is a platform that allows people to submit information on everyday, non-emergency problems like a traffic light timing problem, road potholes, or blocked bike lanes. Governements can then effectively respond to these issues, as New Haven, Conn. policemen did when they arrested the culprits of petty neighborhood crimes reported through this platform. From entrepreneurs reaching new markets in Ghana, to citizens disrupting the trade of fake prescription drugs in Nigeria, SeeClickFix is just one of many amazing examples Jain uses to illustrate the powerful impact this technology has on people looking to usher in meaningful social change. SeeClickFix user Patricia MacNary was fed up with a filthy situation behind her residence in Troy, New York. The live-in landlord reported that the alley behind her house was overflowing with garbage thanks to a negligent landlord and his or her careless tenants. Patricia created Issue #88079 and described the mess in great detail. The garbage in the alley is disgusting; it's all out of the bags!! Rats are having a ball! These users are a perfect example of how to quickly and peacefully resolve issues while strengthening communities through SeeClickFix! Forget FarmVille. There's a New Request in Town! While procrastinating on Facebook last night, I received a notification from an unlikely source: Alger Street in Brockton, Massachusetts. I am one of the meanest, ugliest roads you've ever seen. I pop tires, dent rims, break shocks, you name it I do it. I have been this way for about 10 years now. Even though people complain about me constantly, NO ONE CAN CHANGE ME. I'M A MONSTER!!! Since its creation, Alger Street has generated a lot of activity from local citizens whether it be in the form of wall posts, photo uploads, or friend requests. Right now, the street has 526 friends and that number keeps growing! They took over Egypt with a Facebook page. We figured we could get Alger Street fixed. According to the Patriot Ledger, Brennan filed a claim with the city to receive compensation for automobile damages caused by the street. While the claim was denied, she appealed the decision. The city continues to patch the road, but permanent fixes have yet to be implemented. However, there is hope for Alger Street commuters! Though the road may suffer from poor construction, the city's Public Works Commissioner Michael Thoreson said they may redesign the roadway in the future. For now, it looks like Alger Street will just have to continue bidding its time rocking out to Slipknot and watching Armageddon (listed as the road's favorite band and movie, respectively). A few weeks ago, the town of Saugus, Massachusetts reached out to us about implementing SeeClickFix Plus in their community. This morning, MIS Director Michael Donovan announced Saugus' adoption of our platform which allows citizens to report issues in their neighborhoods via the town website, mobile apps, or our main website. This reporting tool holds our government accountable to take care of quality-of-life issues that affect our citizens, and it holds the people accountable to take part in their communities. It's a win for everyone. We couldn't be more excited about adding Saugus to our growing list of government partnerships. We look forward to seeing how the town improves its community using just one click! While most people's "things to do with a pothole" list ends somewhere between cursing it's existence and filling it with asphalt, today at SeeClickFix headquarters we've been looking at some more creative uses of these pesky problems. Colorful yarn acts as pothole padding for motorists and cyclists in Paris thanks to Parisian artist Juliana Santacruz Herrera. Give your neighbors a lesson in geology, or a slight panic attack, by creating your very own lava filled potholes. Claudia Ficca and Davide Luciano, the photographers behind mypotholes.com, put a NYC pothole to good use by serving up a delicious (and al fresco) dinner. Of course, we here at SeeClickFix believe that a pothole is best used as the topic of a report submitted to us. Although SCF is generally used for 311 type-issues, I saw that many comments were more planning related. In an effort to provide the planners of the Green Code with as much useful information as possible, I combined the Buffalo Citizen Engagement map on the Green Code site with the comments from See Click Fix onto one map. This helps us visualize all types of issues no matter how they were submitted to the web! According to Green Code, they seek to "implement a new regulatory framework for the development of [their] neighborhoods" that will improve residents' quality of life by employing smart growth standards, encouraging both economic and environmental sustainability, promoting fiscal growth, and allowing for development transparency. Their "Green Code" would replace Buffalo's zoning ordinance passed in the early 1950s. We're honored to help Buffalo Green Code on its mission. We're even more excited about SCF's Ben Berkowitz speaking alongside Green Code's Crystal Wilson at the APA's National Planning Conference in Boston two weeks from now! Based in Saskatoon, the StarPhoenix just started documenting potholes in the area using our interactive SeeClickFix widget. While they've already reported several, they need your help to track local potholes by posting them on SeeClickFix. And if you have any good photos, send them to citydesk@thestarphoenix.com and they may be featured in their photo gallery! We're excited to partner with this Canadian media organization and wish them luck on their pothole-filled journey! Back in early March, Ben Berkowitz and the SeeClickFix team won BusinessNewHaven's 'Innovator of the Year' award. Its February issue even featured SeeClickFix in an article entitled "Power to the People: A Revolutionary Online Tool Promotes Positive Change, One Click at a Time." A huge congrats to everyone at SeeClickFix! Read some excerpts below. You can check out the full article here. When Ben Berkowitz noticed some ugly graffiti staring back at him from a neighbor’s building, he did what many people would do: He got worked up. So he called City Hall — and ended up with even more aggravation. “I am actually a big graffiti art fan, but this was not the kind that belonged on my neighbor’s building,” Berkowitz recalls. He called the city and quickly became disenchanted with his inability to get past telephone gatekeepers to talk to someone who could actually do something. Out of his frustration came a plan to change the way citizens could effect positive change. [Robert] Smuts’ staff was faced with prioritizing and triaging a blizzard of e-mails. “As SeeClickFix was growing and finding out what they were all about, I met with Ben and we talked a lot about how it could be more helpful to the city and other municipalities,” says Smuts. “He picked my brain, wanting to know how governments think.” Soon Smuts realized he had found the solution to creating a public interface that worked. From those discussions, SeeClickFix Pro was created and New Haven now integrates the program with its existing City Works work-order program. Using SeeClickFix Pro, when someone posts an alert, it feeds automatically into the city’s Public Works Department. “The idea behind what Ben is doing is — rather than someone shaking their fists and being upset about something and complaining — he found other people who think the way he thinks and what he created is crowd-sourcing community improvement,” [Jonathan] Cooper says. Humans are competitive by nature, and that doesn't change when potholes are involved. As a SeeClickFix media partner, the News-Herald launched a campaign yesterday to fix Ohio potholes in serious need of repair. Known as the 'Pothole Patrol,' the newspaper will be collaborating with Adventure Chrysler Jeep Dodge Ram to help alleviate the region's pothole mess. They'll be sharing the information reported on the website with those responsible for fixing them. The best part? Include 'Pothole Patrol' in the issue summary and you could win one of two $20 Speedway gas cards or one of five certificates for a free oil change courtesy of Adventure Chrysler Jeep Dodge Ram. To join the Pothole Patrol, click here. My hometown of Shelton is known for many things: the Wiffle Ball, canary-fighting rings, and NFL quarterback Dan Orlovsky. Until recently, fixing potholes did not fall into this category. Using SeeClickFix, I posted two issues involving poor road conditions in early March (see issues #86756 and #86024). While my potholes still remain, another Shelton resident just discovered the pothole she had posted no longer exists! Reported just six days ago and viewed over 50 times, issue #89364 entitled "Very large pothole" involved a very large pothole on Beardsley Road in Shelton, CT. Who could have guessed? According to the SeeClickFix user, the pothole had appeared a few weeks ago and was very hard to avoid while driving. I was driving home from work today and was expecting to hit this pothole for the millionth time when I noticed....it is fixed! I am so happy and really impressed that it was fixed so quickly. As a lifelong Shelton resident, I'm excited to see my local government stepping up and improving the quality of our roads. Let's hope this continues in the future! Recently, I stumbled across an interesting YouTube video about employing SeeClickFix to the benefit of elders. A health care consultant (and singer! ), AnthonysSong advocates for senior citizens everywhere. When he came across SeeClickFix, he deemed it 'an idea worth emulating' and believed there should be an equivalent in elder care. He does cite Naturally Occurring Retirement Communities (NORCs) as providing services for aging populations, but he says it's "not the case across the board because obviously there are people who are living alone and not in a community of elders who need help as well but are isolated from other people." The whole idea of the community rallying around the needs of the people and issues within that community is a good one and we just need to adapt it for rallying around the causes of our elders and everyone chipping in to make that happen. If you want to learn more about AnthonysSong and what he does, check out his website and Twitter. It may be a long road to recovery in Japan, but the nation is already making incredible progress after the March 11th earthquake and subsequent tsunami destroyed the nation's means of transportation and infrastructure. In just six days, construction crews from NEXCO company repaired one stretch of highway in Naka. Following the destruction, the Great Kanto Highway was left with a 150-meter crack running down its main section. While the crews only started working on March 17th, they finished repairs and opened the road to traffic yesterday. With winter wrapping up, citizens across the country (and globe) have been reporting potholes in massive numbers. Compared with destroyed roads in Japan, potholes seem like an easy fix. Yet, it can take many months (even years!) for towns and cities to repair them. Doesn't make sense, right? Ben Berkowitz of SeeClickFix definitely has some new dance partners; He'll be talking to IREX about their media training groups, and also their library program in Romania, and with Chris Worman about the TechSoup program there. Meanwhile Bill Strathmann at Network for Good has designs on SCF too... After weakly begging off the a.m of Day 1 (Valentine's Day? Don't make me go all revolutionary guards on you, Billy), Strathmann sprang off of his red eye from DC in a relaxed, collaborative mood. Re SCF he wrote, "Network for Good is increasing its training to nonprofits on tech tools that help engage their communities and drive donations. We're reaching over 150,000 nonprofit professionals today. SeeClickFix is a great community tool that has a latent role for small nonprofits (imagine the Anacostia Watershed Society adopting the region it cares about on SeeClickFix and accessing/engaging citizens who care about the same issues in the same geographic area – trash in the Anacostia River), but SeeClickFix does not have access to small nonprofits (nonprofits don't know it exists or how they could use it)." TechSoup also mentioned that Timothy Pylate of the Eurasia Foundation wanted to follow up with Ben about how Ukraine could utilize a platform like SeeClickFix for their e-governance programs. SeeClickFix is helping to improve communities around the world as reports from citizens in Espoo, Southern Finland pour in. Currently, there are around 160 open issues reported there with watch areas set up for the mayor, an Espoo board member, and a local neighborhood group. With walking and cycling as major modes of transportation, Espoo has a great demand for SeeClickFix; the maintenance of sidewalks and bike paths is critical. For example, one open issue involves an unpaved section of a bike path. Yikes! Espoo is another great place for citizens to use SeeClickFix and work together to improve their community! With winter coming to an end, potholes of all shapes and sizes continue to negatively impact communities across the globe. Believing roads affect our daily lives, Pothole.Info recently highlighted SeeClickFix's success with pothole abatement, emphasizing how the site simultaneously engages citizens and helps local governments save money. Citizens are coming, local governments are responding – and the potholes are getting fixed. Pothole.info attributed part of SeeClickFix's success with the implementation of smartphone apps since citizens, particularly millennials, view them as tools for change and for organizing groups of people. In other words, if hundreds of people in a medium-size city take camera phone pictures of potholes and then forward them on to the city’s streets maintenance department, more of the most important potholes will be filled and fixed faster. Net result: a whole city will become more drivable. Like we say here at SeeClickFix, potholes really are the gateway drug to civic engagement! One month ago, SeeClickFix user Alan McHone reported a broken sidewalk in Charlotte, NC. Viewed over 100 times, the issue deals with a sidewalk damaged in multiple spots. While the user says it's normal for the city, he thinks this sidewalk seems extra dangerous. It is about 5 feet from the CATS bus stop, and every time the bus runs over it, it actually moves and goes up and down about 2 feet in the air. Imagine that while standing on or near it. Or when it is filled with muddy water, which it often is. While the issue remains unresolved, we recently found his YouTube video of the sidewalk. If you want to help Alan fix this issue, comment and vote here! Resolving issues isn't a competition. If it were, however, the Town Green Special Services District of New Haven would totally dominate. Our very own Ben Berkowitz reported two separate issues involving graffiti in the last day. And they've already been cleaned up! Reported yesterday, issue #89849 involved graffiti on State Street, which the Town Green District painted over within the day. Think that was fast? Well, the organization's Clean Team already dealt with another spot of graffiti (issue #90153) posted just three hours ago! The Town Green District seeks to make New Haven an "internationally competitive urban environment in which to live, work, learn and play." We think they're doing an exceptional job at keeping our city clean, safe, and fun! As wintry weather and potholes cause trouble across the country, one city strayed from the trend and dealt with a pricklier issue. Reported only 15 days ago, issue #86215 "Dead Cactus" was resolved in Albuquerque, NM last Friday. Local resident Joe Barela reported the massive cactus located on the Watercress and Jefferson median and believed the overflowing plant could be dangerous to citizens. The cactus has large needles and is a hazard to traffic and pedestrians. It is all gone. It was gone as of Friday afternoon. The area looks so much better. Thanks to everyone. With warmer weather approaching, cities and towns across the United States are starting the process of patching potholes. The Saratogian, for example, recently looked into resident complaints about potholes and other issues on Jefferson Street in Saratoga Springs, NY. Tons of people drive the road daily to go to the Racino. I hit one at least every time I leave my house (no choice with snow/traffic)! This should definitely be fixed as soon as possible...I'm afraid of getting a flat every time I hit one. They're huge! Another user, Jules, agreed about the driving conditions and thinks it should be one of the town's top priorities. It's not even "bad." It's downright awful. The Saratogian recently spoke with Anthony Scirocco, the city's Public Works Commissioner. Scirocco said that they were currently working on their paving schedule and Jefferson Street was being considered. He added that city repairs would depend on state funding. He also mentioned that crews started repairing potholes on nearby Crescent Street. They’re going to continue to work in that area up there. Like other media outlets, the Saratogian continues to shed light on community issues that need to be addressed and we want to thank them. Know of more potholes on Jefferson Street? Report them on SeeClickFix! Back in October, we told you about one Guam resident Don Muna who took matters into his own hands and dealt with graffiti on the Yona Bridge just eleven days after being reported. After spending some time on the Interwebz, I stumbled upon this awesome YouTube video that documents how he cleaned it up. Citizens everywhere can learn a lot from this SeeClickFix user! With winter coming to close and rainy season approaching, it's important to check your residential and street storm drains to ensure they're working properly. And if they're not, report them on SeeClickFix! For instance, in Richmond, VA, one resident noticed that dirt and debris from recent storms had blocked the drain on S.Laurel and China Streets, and alerted the local government. Know of some more blocked drains? Submit them here! To Change Lanes or Not to Change Lanes? In our last blog post, we wrote about WBTV's investigation into an issue reported via SeeClickFix in Charlotte, NC. The local television station is now looking into another complaint in the same area. There are three lines riding up North Tryon from East Mallard. But, when you come up to the Bloom plaza that third line is really block off for you to get over in the Left lane then if your turning onto J.W. Clay then get back over in the Right lane which turns into a turning lane. Well, the problem here is that numerous people ride that lane out. I'm a safe driver licensed in GA and you will get a ticket riding over the other white lines. So, if they can just fix it and make it a third right turning lane, I will be so happy. I almost get hit every time I use that lane because i am trying to get over where it is marked and not by riding out the crossed off lane. It is VERY unsafe. There have been MANY close calls there. According to WBTV, there are "somewhat faded stripes, a solid lane marker stripe, and right turn arrows painted on the road." Some drivers cut across those stripes while others switch to the right lane after already passing them. Viewed over 370 times, the issue has not been fixed since being reported five months ago. WBTV decided to contact the North Carolina Department of Transportation and received promising feedback from Jen Thompson. She said, "Our plan is to remark the lines that separate the two thru lanes from the right lane, but we will also change the lane markings to indicate a thru/right combination lane up to Normandy Drive, then dropping to a right-turn only onto Normandy." "The contractor will be removing the existing right arrows and cross hatchings across the lanes," Thompson added. "They will be replaced with the right/thru combination arrows, skip lines, along with right arrows and the word "ONLY" approaching Normandy Drive." The news outlet said the work should begin in early April. Keep the momentum going, WBTV! Ben Makes CT Magazine's "40 Under 40"
Connecticut Magazine recently debuted its "40 Under 40" list and guess who made the cut (and front cover)? Our very own Ben Berkowitz! He was listed as part of "a new generation of leaders full of energy, ideas and the determination to steer an unswerving course into the future." Congrats, Ben! Berkowitz is CEO and a co-founder of SeeClickFix.com, a website that allows citizens to post word of problems in their neighborhoods—such as illegal dumping or dangerous potholes—that need attention. Fixes can come from town officials or others, such as neighbors with suitable skills for the job. The site has a secondary purpose of making local government more transparent. Berkowitz says the inspiration for his site sprang from a desire to improve his own community while working with his neighbors and his government. He was named Huffington Post’s 2010 Tech Gamechanger. Eleven months ago, SeeClickFix user "Jen" reported issue #34221 and saw no results. Now, local television station WBTV is investigating the situation. Having been viewed over 680 times, the issue deals with illegal activity happening on the 4400 block of S.Tryon Street in Charlotte, NC. Resident Jen wrote: "drug, prostitution, loitering, police know this. And music from cars all night [...] there have been t[w]o robberies at gun point this week and the police still do not watch this area." When WBTV spoke with local residents, they discovered that the complaints were "consistent with the issues that have been in that neighborhood." According to WBTV, the station recently monitored the block for two days. While they did not see any suspicious activity, they said that the proper authorities, the Charlotte Mecklenburg police, have been notified of the complaint and are responding to the resident's request for additional patrols in the area. Thanks to snowy conditions, the Saratogian found itself making headlines when residents started complaining about the inaccessibility to its newspaper boxes. Using the SCF mobile app, one Saratoga Springs resident reported that he was unable to access one of their newspaper boxes last Friday because of the snow and requested they shovel around it. "As an older person, I fell trying to buy a paper." Three days later, the same resident reported that another newspaper box was snowed in. Now, the Saratogian is responding. Jim Collier, the newspaper's circulation director, was initially unaware of the problem, but promised to resolve the issue. "We have a couple of guys that are supposed to be doing that," he said. "We'll get on top of it." We're proud to partner with such a responsive media organization. Keep up the great work! The Next Big Thing in Social Media and Politics? With new technology emerging daily, POLITICO recently discussed the power of location-based apps to encourage civic engagement. And guess who got a shout-out? SeeClickFix! Possibilities for using social media to improve government services are already coming into focus. The website SeeClickFix allows people to report potholes and other problems when they encounter them — the idea being that the public airing will prod officials to get them fixed quickly. We're honored to take part in this social networking revolution. As we like to say, improving your community is just a click away! WECT reported that the town of Carolina Beach, NC recently patched several potholes along Greenville and South Sixth Street after someone reported the issue on SeeClickFix. There are so many that if you meet an on-coming car, you hit them. I have hit them several times, causing my car to lose its alignment. According to WECT, crews have temporarily repaired the potholes and will make more permanent fixes in the future. Tim Owens, the town manager of Carolina Beach, described the process: "We have patched this area using something called cold patch at the intersection of Sixth and Greenvilles. We use cold patch in the winter time when you can't pave to get us through. We will get this intersection and other areas on our maintenance schedule soon." Know of some more potholes (or issues) in Carolina Beach? SeeClickFix them here. With the recent budget cuts and subsequent layoffs in New Haven, library hours were drastically decreased starting in late February. The main library branch saw a reduction from 185 to 148 hours per month, while the neighborhood branches saw larger reductions from 136 to 96, which includes the elimination of Saturday hours. Now, residents are speaking out against the cuts and taking action via SeeClickFix. Designated issue #86403, the "Petition to Restore Library Hours in New Haven" has seen a lot of activity since being posted 9 days ago. The issue has been viewed over 1500 times, with 123 users voting to immediately restore the eliminated hours. According to the SeeClickFix posting, an anonymous user started the petition at the request of an elderly New Haven resident who could no longer access the Internet because of the eliminated weekend library hours. The anonymous SeeClickFix user wrote that local libraries are crucial to "public space and civic vitality in New Haven" and "should be active community hubs where neighbors can meet and cement relationships." The libraries provide many services to all members of the community, from educational resources and public computer access to providing space for residents to gather and cultivate relationships. What about the children who like to go to the library on their day off from school? SeeClickFix helps citizens communicate and collaborate with each other and their local governments. If you want to get involved, vote to restore the library hours here. With just one click, you can help improve the lives of your neighbors! To read more about the reduction in library hours, check out this article from the New Haven Independent. message is clear: citizens want a pedestrian-friendly city. According to a recent post on the NRDC's Smarter Cities blog New Haven has the highest percentage of people who walk to work in New England, and the second highest percentage of people who use non motorized transportation. But the walkability of any city matters for many reasons. In 2009, CEOs for Cities released a report entitled “Walking the Walk: How Walkability Raises Housing Values in U.S. Cities.” Among their findings? Property values increased with proximity to shops, restaurants, cafes, schools, libraries, and other amenities. increase physical capital like property values – it increases social capital, too. Social capital is essentially a measure of community. Your friend, your neighbor, the guy who pours your coffee: they're all social capital. They're all part of your daily network, and they each do their part to enrich your daily life. They make you feel less isolated, they tell you about a job opening, and they'll watch your laptop while you're in the bathroom. And you'd do the same for them. Together, you're building social capital. Social capital increases with walkability. You're more likely to bump into your neighbor at the store if it's right around the corner. You're more likely to stop at the same coffeeshop if it's on your walk to work. These daily interactions strengthen and build on social capital, and they're more likely to occur if citizens are pedestrians. But proximity isn't the only factor here. Safety – and keeping our public resources in good repair – matters, too. That's where SeeClickFix comes in. By engaging and empowering citizens to report things like a broken streetlight on Congress Avenue, or cracked sidewalks on Edgewood Avenue, SeeClickFix doesn't just build social capital online – it keeps it growing offline, too! Newark Ohio is one of 6 new municipalities using SeeClickFix Plus this month. 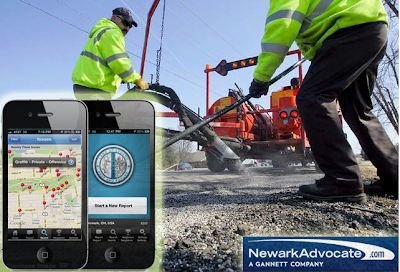 Coffman, Newark's public services director, on Monday announced the launch of SeeClickFix, a free application -- also known as an "app" -- Newark residents can download to their mobile devices. The app allows users to take a picture of a pothole, cracked sidewalk or other service department issue and forward the problem to department representatives for attention. Using GPS technology, SeeClickFix pinpoints the location where the photo was taken, Coffman said, and public service department representatives track the reports and respond to each one with a comment to acknowledge it has been received, fixed, or if not, the reason why. "People can not only vote to have a problem fixed, but also make comments and track our response," Coffman said. A SeeClickFix widget at NewarkAdvocate.com has similar capabilities, sans the photo and GPS; instead, submitters manually input the location of the potholes. Can Graffiti and a Busy Signal From City Hall Lead to Entrepreneurial Opportunity? It Did For Ben Berkowitz…..
All Ben Berkowitz wanted to do was report some of the graffiti he saw in his neighborhood to City Hall to clean it up. As he continued to get the runaround, an entrepreneurial idea, SeeClickFix.com, was born. Three years later, Ben has used the power of social media to help the Public Works Departments of over 100 American cities become more accountable to their constituents en masse. Ben talks with “American Entrepreneur” Ron Morris about his story, and his mission. Sandy, UT — Cityworks | Azteca Systems, Inc., the leading provider or GIS-centric management solutions, today announced the integration of Cityworks and SeeClickFix, a mobile application for citizen requests. This integration is currently being utilized at the City of New Haven, Connecticut, with great results. 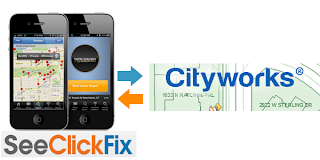 Providing a social platform for exchanging information with local governments, SeeClickFix offers Cityworks technology via a mobile app for iPhone, Blackberry, and Android. The idea is to encourage active citizenship by enabling citizens to report municipality issues via the smart phone. The integration allows citizens to enter Cityworks service requests from their personal mobile devices directly to the City. 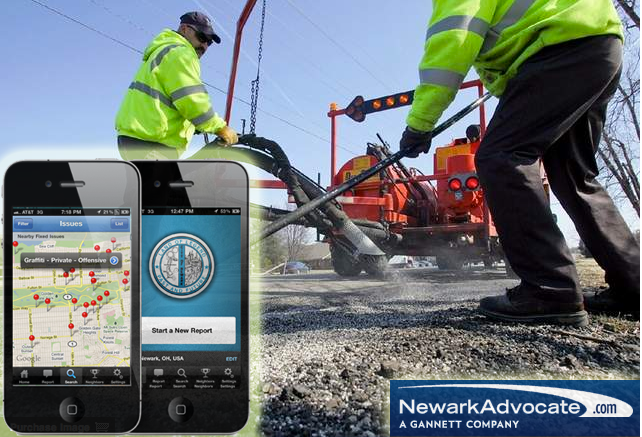 In addition, citizens with an iPhone can take a photo of an issue, locate the issue in the GIS, attach the photo to the map location, and submit it as a Cityworks service request to the city. Citizens use the open 311 standard API application to submit work orders. The Cityworks/SeeClickFix integration will be showcased at the upcoming 2011 Cityworks User Conference in a presentation and demo by SeeClickFix and the City of New Haven this May. Visit www.cityworks.com/UC11 for more information about the conference. SeeClickFix has been encouraging citizens to constructively communicate with governments since 2007 and is active in thousands of communities around the United States and abroad. Through mobile web, web, iPhone, Android, and Blackberry apps, the platform is the most widely distributed citizen reporting tool in the country. The platform is fun and easy to use for citizens while being inexpensive and easily adaptable for governments. The City of New Haven joins 40 other cities in the United States that have purchased the enhanced SeeClickFix features for their citizens and municipal workers.